Well here we are. Summertime is just about over, and the kids will be heading back to school for the rest of the year. The boys and I had a blast these past couple of months. We spent our summer outdoors at various parks, ponds, pools, splash pads, hiking, and they even sewed their own stuffed animal monsters. They took a lot of work to create, but it was so fun watching their designs come to life. I’ll definitely have to make a future blog post about it. It’s so hard to believe that our oldest will be starting 1st grade in a week. I subconsciously want to ask people to pinch me to see if I’m dreaming. I mean… there’s NO WAY I have a 6-year-old. In the past year, I feel like I've slowly watched him lose that young, child curiosity. He’s moved into the realm of video games (mostly Minecraft), Harry Potter, superheroes, and Legos. With fall weather right around the corner, I’ve been working on designing some new hat patterns to share on my blog. I really wanted to expand my creativity and come up with some new designs that were fresh in the community of fiber artists. When a new design sparks, the first thing I grab is my iPad. I love using the “Procreate” app to draw out my designs. Let me tell you, it’s much easier to change the shape, pigment, or overall design of a project with an electronic device, than it is to constantly frog a project and start over again and again. I like to play around with designs before I ever put a hook to yarn, so having that easily customizable option, helps me create the best versions of my ideas. Woodland animals are all the rage, so I couldn’t help but bring this cute little fella to life. I immediately fell in love with this design because of the cartoon-like characteristics that reminded me of “Flower”, the sleepy skunk off of Bambi. 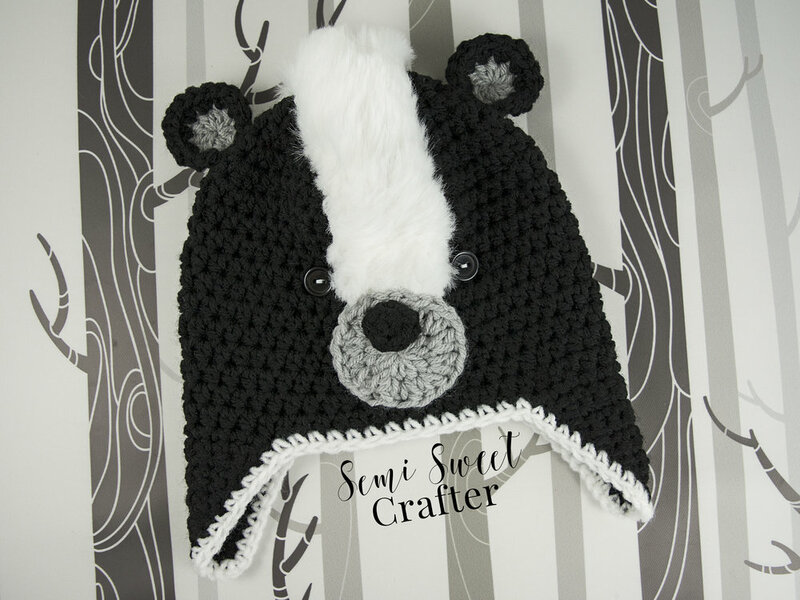 The added faux fur fabric adds to the cuteness and brings the skunk trademark to life. Enjoy! 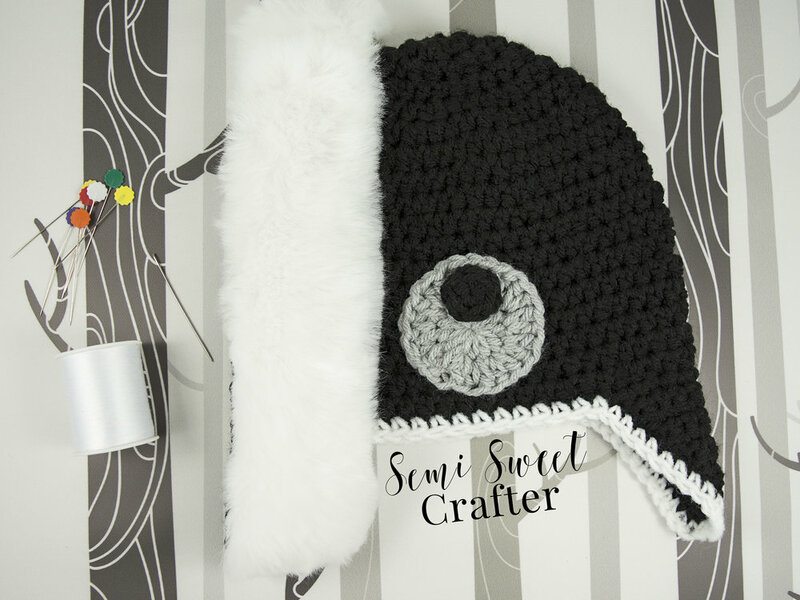 To purchase an optional ad free, fully downloadable, PDF version of this pattern, including both written instructions and the added photo tutroials, visit my Etsy Store here or my Raverly Store here. Tie off. Switch to white yarn. Sc evenly, all the way around the hat. Sew the nose onto the snout (see pattern pointers). Sew the nose onto the snout and wip st the snout to the body (see pattern pointers). Using fur fabric, cut a rectangle strip that's 8" in length and 1 1/2" wide. Alining the strip with the top of the snout and going down the back of the hat, sew stitches all the way around the strip to secure it to the hat (see pattern pointers). Using two 15mm black buttons for eyes and the white thread, secure the eyes onto the hat base right above where the top of the snout and forehead strip meet (see pattern pointers). Sl st into next st, tie off. Switch to black yarn. Sl st into the first hdc and tie off leaving a long tail. Sew the ears to the body (see pattern pointers). 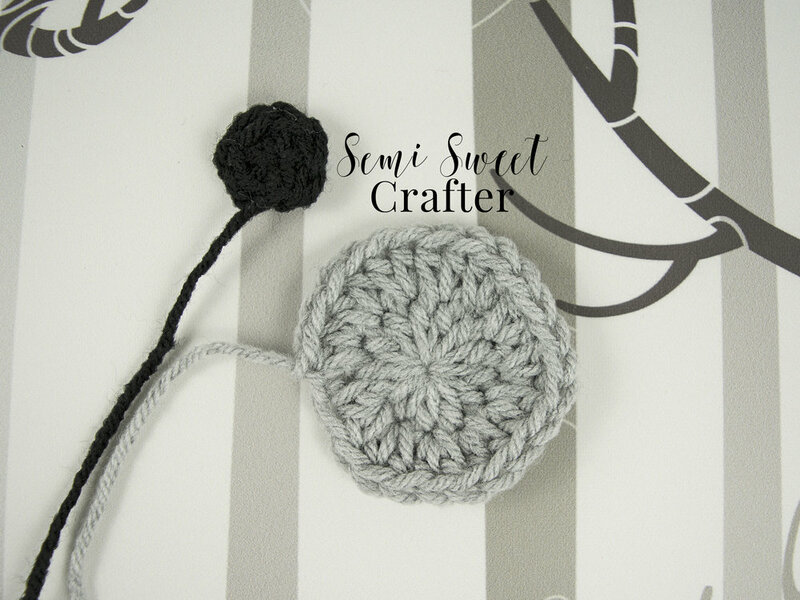 Using black, grey, and white colored yarn. Cut 18 strands of yarn 28" in length (6 of each color), then separate 9 strands for EACH earflap. Fold the 9 strands in half (three of each color), and secure them to the hat. Finish the tassels off by braiding the colors together and then placing a knot in the bottom of the tassels to secure the braid (see pattern pointers). This is what the base of the hat should look like. You may have more or fewer rounds depending on what size is being made. For this example, I am using the toddler size. This is what the nose and snout should look like. Using the long tail from the nose, sew stitches all the way around the nose securing the nose to the snout. Aline the Snout on top of the crochet hat base towards the bottom of the hat. Using the long tail from the snout, sew stitches all the way around the snout, securing the snout to the base of the hat. Using the forehead strip measurements listed in the pattern part above, trace the desired rectangular strip onto the back of some fur fabric using a water soluble marker or pencil. Cut out the rectangular strip and pin it to the hat base starting at the top of the snout and down towards the middle/back of the hat. Using white thread, sew stitches along the sides, all the way around the forehead strip to secure it to the hat. This is what the forehead strip should look like. You may have a wider or thinner rectangle depending on what size of hat is being made. Using two 15mm black buttons for eyes and white thread, secure the eyes to the hat base, slightly close together and just above where the snout and forehead strip meet. This is what the ears should look like. For placement, I like to place them towards the top of the hat but down just a slight bit (just above where the increase rows on the hat stop) so they slightly turned outward. Using black, grey and white yarn. Cut 18 strands of yarn 28" in length (6 of each color), then separate 9 strands for EACH earflap. 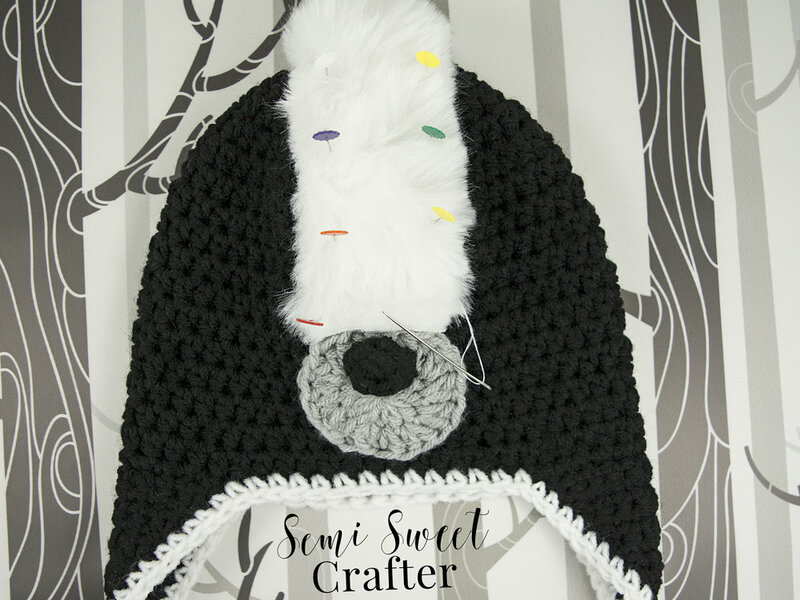 Fold the 9 strands in half (three of each color), and loop them around the bottom of the earflap to attach them to the bottom of the hat base. Splitting the strands into three equal parts, braid the strands all the way down and knot the bottom. Trim the remaining ends sticking out so that they're all the same length. Repeat for the other side.